An amendment to the Highway Traffic Act has changed the definition of a road-building machine effective July 1, 2017. This new regulation, Ontario Regulation 398/16 - Road-Building Machines, reclassifies which types of vehicles will continue to be considered road-building machines. It is important that your customers review these changes, acquire proper registration, driver licensing, inspection and insurance for vehicles affected by this legislation. Vehicles constructed on a truck chassis. Vehicles that comply with or are intended to comply with the Canadian Federal Safety manufacturing standards for highway vehicles or comparable standards from another jurisdiction. If a vehicle no longer falls under the definition for road-building machines, it will be classified as a commercial motor vehicle. This means that the vehicle will now require automobile insurance, Commercial Vehicle Operator’s Registration (CVOR), vehicle registration, and a safety inspection. Drivers will also require the appropriate driver’s license class and must adhere to hours of service regulations (exemptions apply). If your vehicle is covered under a property policy as contractor’s equipment and is no longer classified as a road-building machine, it should be moved to a commercial automobile policy, and will be subject to existing commercial automobile coverage and underwriting process. 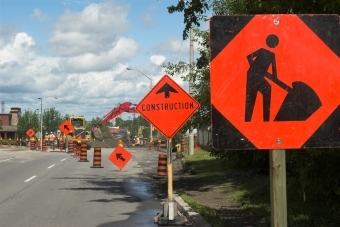 More information on these changes and the new regulation, Ontario Regulations 398/16 – Road-Building Machines, can be found on the Ontario Ministry of Transportation website. As outlined in this new regulation, in order to register a former road-building machine, one of the requirements is proof of motor vehicle insurance. Whether you have one vehicle that needs to be insured or a fleet, contact us today to obtain a free, no-obligation quote.